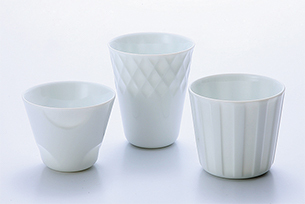 Oda pottery was founded in 1921, in the production area of Minoyaki, Mizunami-shi, Gifu Prefecture. In the Mizunami area in the eastern part of Gifu Prefecture, together with close by Tajimi City and Toki City, the area flourished as the production centre of Minoyaki, it is also called "Japan's pottery capital" because of its wide variety of materials, designs and technologies and it has supported Japanese ceramics culture ever since. 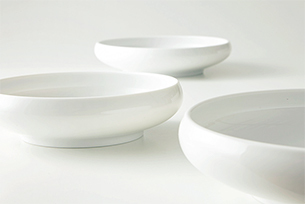 These white porcelain bowls further enhance the beauty of any dish. With their powerful charm you will want to make daily use of them. The greatest strength of Oda pottery products is its technical ability to create flawless "white" even with white porcelain. Using the charm of white porcelain together with quality and technology, we bring a new era of white porcelain bowl from Japan suitable for living in modern times while constantly progressing. We would like to continue to deliver high quality products to various countries around the world. 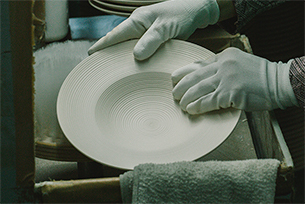 Oda pottery is a manufacturer specializing in dishes made with a high degree of difficulty and perfection. We pride ourselves on the perfection of our white porcelain, in particular its colours, shapes and thickness that cannot be rivaled. We are especially confident in our technology that brings out the very best of our materials. While we are constantly producing our fine products every day, we keep in mind that we must maintain and improve the quality of our products. We respond to all of our customers’ requests with a high level of attention according to their specifications such as shape and design by making use of the methods below. This is a method to mold the bisque body. It is stretched into the mold with a high speed rotating metal roller. 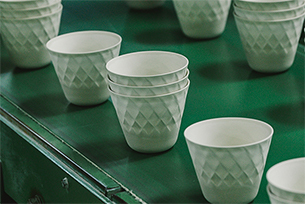 This method is mainly used for the mass production of rotating bodies such as plates, bowls and cups. We have seven forming machines and each machine is capable of producing about 3000 units per day. The initial costs of the machines are necessary for this kind of high volume production. However, mass production brings down the price of each unit. This is a way of forming the bisque body using pressure. 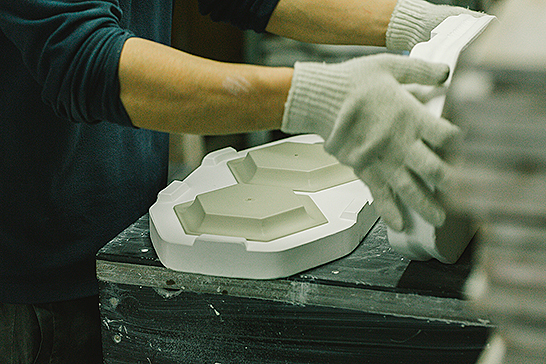 Using pressure, the muddy bisque body is cast on to a plaster mold. It is then taken from the mold once all of the moisture is extracted from the bisque body and has become hard. This technique is ideal for the mass production of products with reliefs on both sides, unusual shaped items for example items that are not perfectly round and items that cannot be made with roller machines. 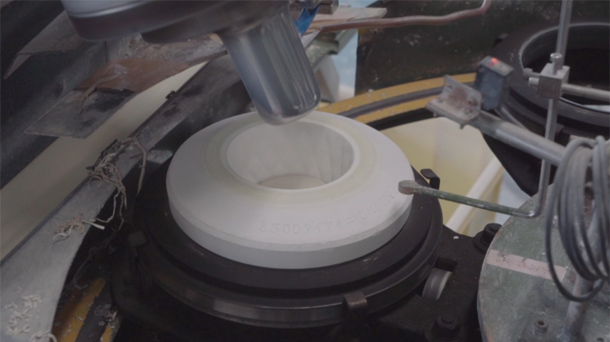 This technique also needs investment plus the cost of the plaster molds however, it is possible to bring production costs lower than that of the roller machine. This is a method of printing with a silicon pad. 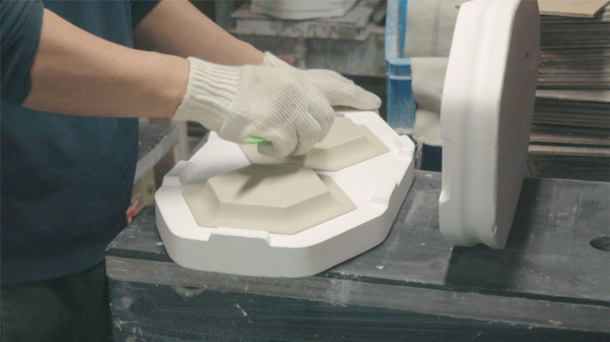 The already imprinted and non-glazed plate is then moved under the silicon pad. 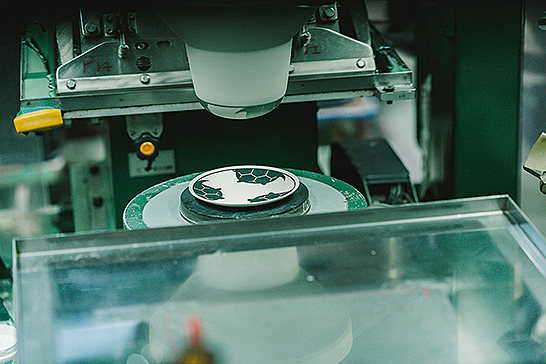 The silicon pad is then pushed down on to the plate transferring its design to the product. The silicon pad is so soft that you can print along the curved edges of the product. It is possible to add gradation to the print by increasing or decreasing the depressions on the product. Up to three colours can be used using this method. This machine is suitable for mass production as it allows for fast and efficient printing. With this method of printing, we can easily transfer patterns or designs to curved surfaces. Using a silk mesh, the pattern or design can be spread on to the fabric and then applied to the product. 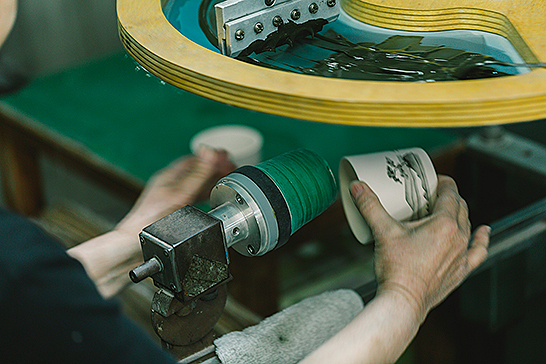 This method is ideal for applying prints to rotary bodied products such as cups. This machine is a fast and efficient way to mass produce this way of printing. With this method, it is possible to first etch a design to Japanese paper (Washi) that has been laid on top of the copper decal. 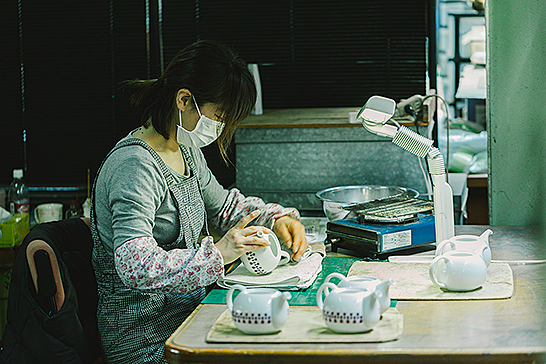 From there, some of the material from the copper decal will transfer to the Japanese paper and we are then able to apply it to the clay. It is also possible to attach joints together one by one allowing you to do more than screen printing. The scratches, distortions and creases add to the warmth of this style. 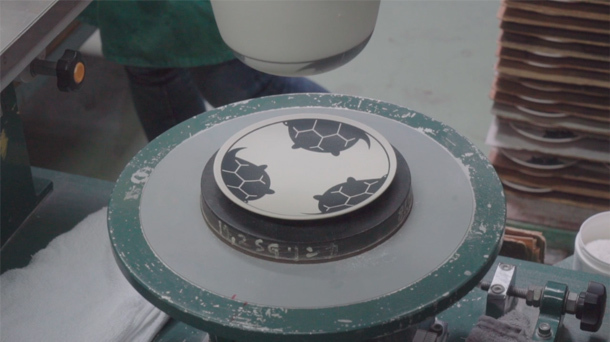 With this method, it is possible to apply designs or patterns to already glazed products. 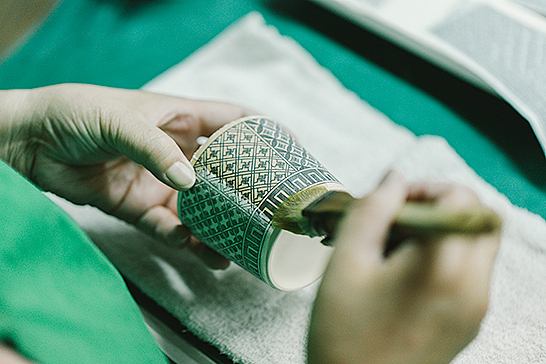 Once fired again, the pattern or design will be attached to the product. In this way, it gives many options for designs with a lot of different colours. There are ways to apply the designs to the glaze or sink the design into the glaze. We can offer you the best way based on your design and budget. Applying the glaze or “glazing” imparts a strength and gloss to the product. The glaze is applied and kilned at 1300 degrees. 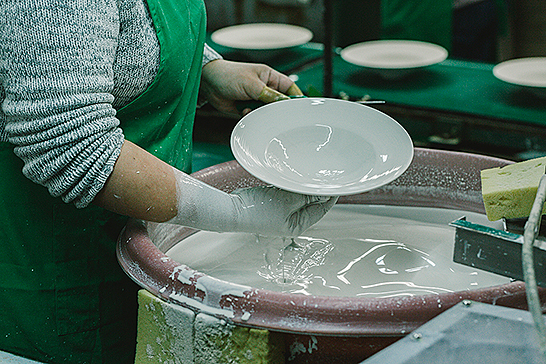 The process “glazing” is very difficult and requires advanced technologies and artisan level skills to keep the layer of glaze consistent all over the product. 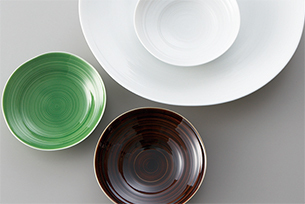 The glaze has infinite varieties of colours, textures and expressions. 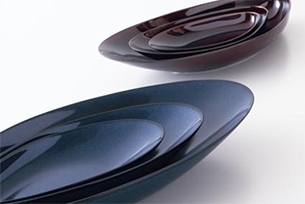 It is possible to develop the glaze that fits your image by repeated testing. 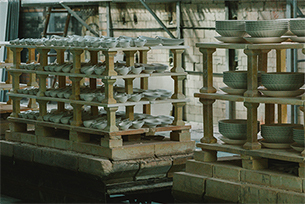 Since its founding in 1921, Oda pottery has worked on numerous domestic and famous brand OEM products. 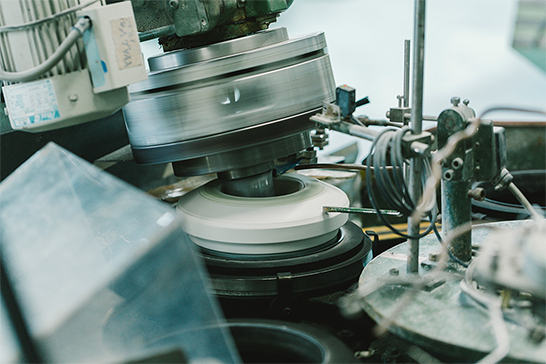 Based on experience of about 100 years, the original products we began making in 2004 have been exported to various parts of the world including the West, grown and have been evaluated worldwide. 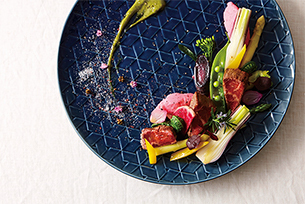 We have also actively exhibited at exhibitions in Japan including the Interior Lifestyle Show and overseas exhibitions such as Ambiente in Germany, Maison Objet in France and Houseware Show in Hong Kong. This series was developed with some of the characteristics of the roller machine that it is made with. By thinning the fabric only in the relief, various patterns appear in a subtle fashion when the light touches it gently glistens on the white porcelain. The mini rock size is also perfect as a candle holder. 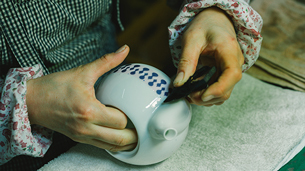 Delicate fine lines fit smoothly with the glaze creating a Japanese feel. This series is of modern Japanese style. Designed with sophisticated shell motifs for ease of scooping with spoons. We feel that this design appeals to everyone and is timeless. This design has been used for Japanese cuisine since ancient times. With this design, the rim of the bowl is curved inward because of this, it is possible to gently cook food. It is also used for Japanese flower arrangement. These are pretty Japanese traditional designs of pine, bamboo, plums, cranes and turtles and they are said to bring good luck. These designs are also influenced by Japanese family crests. 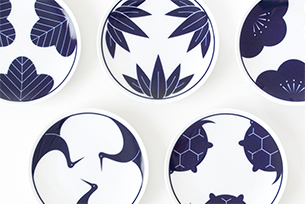 These Japanese traditional patterns on the plates have had their shapes redesigned for ease of use. They express Japanese modern hospitality called ''Omotenashi''.